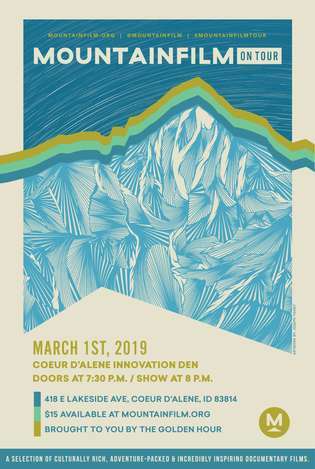 Mountainfilm on Tour visits Coeur d’Alene, Idaho on March 1st, 2019 at the Innovation Den. Join us for an evening of inspiring and captivating films handpicked from the Mountainfilm festival in Telluride, Colorado. Mountainfilm on Tour in Coeur d’Alene will feature a collection of culturally rich, adventure-packed and enlightening documentary short films that align with Mountainfilm’s mission to use the power of film, art and ideas to inspire audiences to create a better world. A Mountainfilm presenter will guide the audience through the program providing insight on the films, filmmakers and subjects. Doors open for the event at 7:30 p.m. and the show will kick off at 8 p.m.
Mountainfilm on Tour in Coeur d’Alene is hosted by The Golden Hour.